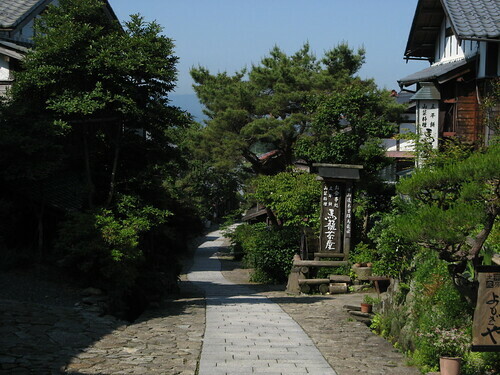 After I cleared the town of Nakatsugawa I climbed the hill and reached the paved road of Ochiai which was my start of the true Nakasendo. It lead me to Magome, reputedly one of the best preserved “old post towns” but while the buildings had the same old style they were new and mostly housed boutique craft stores. The path over the hill was lovely. Sometimes paved with big flat stones and sometimes a more modern rock-chip surface, but always pleasantly amongst the trees. I stopped to air out my sleeping and wash my ground cloth and was packing up when Cathy and Alan came past. 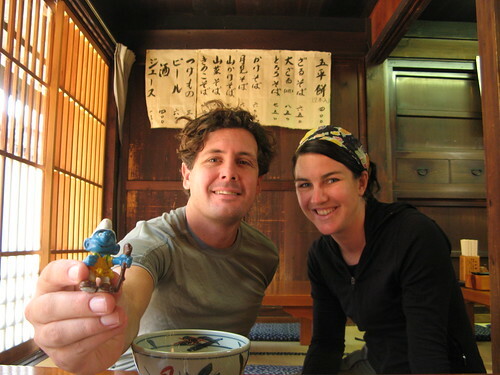 They’re an Australian couple who have been living in Indonesia for over 3 years and are now touring the world starting in Japan. When I told them what I was up to it reminded Cathy of a story she’d heard of two guys walking from opposite ends of Japan. Her travel agent in Brisbane knows Chris and Ian! I asked more about their world tour and found that they’re taking part in one of the things Chris mentioned as organised by ‘The Adventurists’, a car rally from London to Cameroon! Now that is an adventure. Their team name is ‘Tasmanian Smurfari‘ and it all starts around the time I finish so I’ll be watching for news of them. You can sponsor a smurf and receive updates and photos when they’re on the road (all proceeds to charity). We walked together for the rest of the day. Alan lived in Japan for a year while at university and he’s still got a good command of the language. He loves playing up the “strange foreigner stereotype” by enthusiastically greeting everyone he passes and adding something like “nice garden” or “well done” according to his audience. While I’ve been trying to become accepted by being more Japanese he’s found a great way to be accepted by being himself. I’m going to try his plan now. It was an easy day, not too far or too fast. Somewhere along the way my hamstrings stopped hurting and I’ve found myself some soft ground in the beautiful Kiso Valley. I had planned to sleep at the road station but that’d be a crying shame given my surroundings. 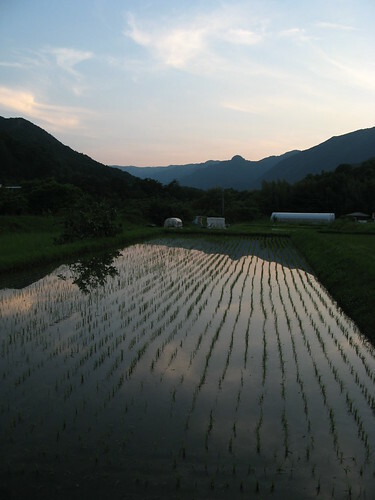 Love the photo of Magome.